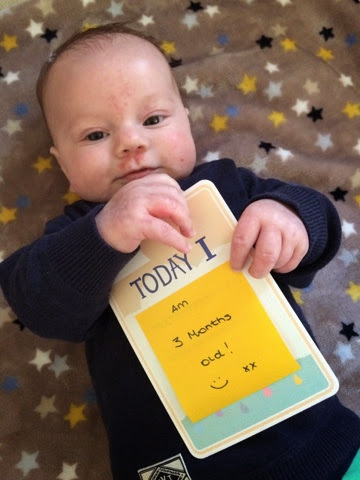 This week, Jake hit the 3 month milestone! On Wednesday 10th December, he had been with us for 13 weeks (or 3 months) and I reflected on just how quickly the time had already gone. Jake is fast becoming amazing! He is now fully following our movement with his eyes, and he looks for us or straight at us when he hears our voices. He's grown so much too! He now weighs over 14lb and is tall; he fits snuggly in his 0-3 month clothes and will soon be moving up into some of his 3-6 month pieces - it's a good job Father Christmas is bringing him some more - including some gorgeous Fred & Noah leggings. He is also seeking out a lot more eye contact and physical contact at the moment; we aren't sure if this is maybe the result of teething or a growth spurt. We're enjoying the extra cuddles all the same. 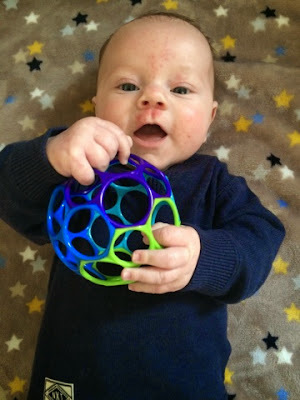 Jake has also found that he can move his arms and hands to grasp objects. He particularly enjoys doing this with his OBall - a gift that was in his first Sassy Bloom Box. He enjoys holding it, waving it and bringing it to his mouth in an attempt to slobber all over it and chew any part that he might be able to. He has also become more interested and aware of the TV - when songs or singing can be heard, his eyes will find the Tv and he will, for a moment at least, be interested in what's happening. Another development this week was that Jake had his 2nd set of jabs at the doctor's surgery. When we arrived, they refused to give him the rotavirus because Jake is suffering with a runny bum at the moment and we're awaiting test results on a sample we sent off - it's probably nothing, but the Health Visitor and Doctor have advised us to. We have to go back next week for the rotavirus if all is clear. So, that's the latest on JD. We're even more in love with him than last week - is that even possible? !